Are you dealing with commercial asbestos issues in Utah? If so, then Utah Flood Cleanup is the company for you. For over 25 years, we have provided Utah business owners with top-notch asbestos removal services. Our experts are always focused on our customers’ safety, and we strongly believe in 100% customer satisfaction. Call Utah Flood Cleanup today for a FREE phone consultation! Should You Be Worried About Asbestos in Your Commercial Building? Since being first mined over 4,000 years ago, asbestos has been very popular and has served many purposes. Asbestos is a group of various minerals, which contain some very beneficial physical properties. 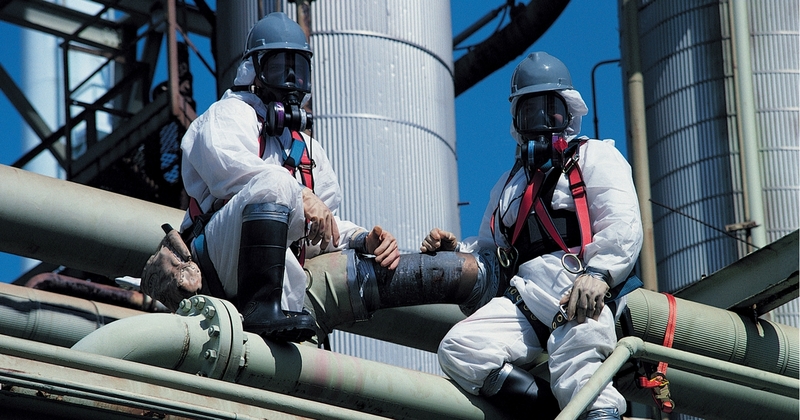 From trapping sound to resistance to fire and heat, asbestos has had many productive uses. However, this powerful substance is very dangerous for our health. One of the most common uses of asbestos was for insulation purposes. Before the 1990s, most homes and commercial buildings were built with asbestos cement. If your commercial building in Utah was built before 2000, we highly recommend getting an inspection to test for asbestos. Given the long list of areas that may contain asbestos, it is a very serious matter. Exposure to asbestos has been linked to the development of lung cancer, mesothelioma, and other serious illnesses. The truth is – checking for asbestos can be very difficult. Luckily, we have the best commercial asbestos removal experts in the area. They can perform the proper tests and gather samples as needed. This is the safest, most-effective way to ensure you’re commercial building is free from asbestos. Although a professional should be checking for asbestos, you can always make some observations for yourself. The important thing to remember is that asbestos isn’t harmful unless it’s components are disturbed. This is very common when remodeling. Drilling holes, moving furniture, cutting open walls, or ripping out floorboards are all examples of how asbestos can be thrown into the air. These actions can release asbestos fibers, which are extremely harmful once inhaled. Tears in your chairs, couches, etc. If you’re looking for professional asbestos removal in your commercial building in Utah, give us a call at 801-416-2666 for a FREE phone consultation! Our Utah Flood Cleanup professionals are are available 24/7. In regards to asbestos removal laws, it is illegal to incorrectly disrupt some asbestos-containing materials in Utah. To avoid any fees or legal issues, the property should be inspected by a State Certified asbestos inspector before any work has started. If a large amount of asbestos is found, you may have to write up a notification to the Utah Division of Air Quality, pay a fee, and wait two weeks before any work can continue. Demolitions do require a written notification — even if no asbestos materials are found. Furthermore, this harmful material must be disposed at an approved asbestos waste location. Our asbestos professionals here at Utah Flood Cleanup know the ins and outs of everything involved with commercial asbestos removal. We can properly test your commercial space for asbestos and diagnose if a removal is necessary. Our experts have over 25 years of experience in the field, helping thousands of business owners with their asbestos removal needs. We abide by a long list of safety standards and are well-versed on the removal process of these dangerous materials. Contact Utah Flood Cleanup today to learn more!